What is a Liquid Democracy? What is a Representative Democracy? What is a Parliamentary Government? 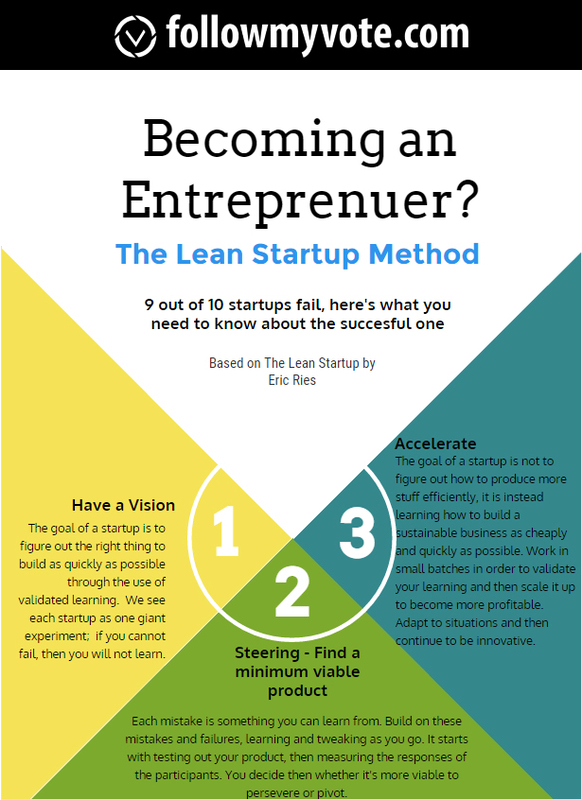 What Is The Lean Startup? The lean startup is a method for developing businesses and products created by Eric Ries. Based on his experience on failing and successful startups, Ries claims that startups can shorten their product development cycles by adopting a combo of efficient experimentation, product releases, and validated learning. By pushing out an initial product that is not perfect but is functioning, they can reduce market risks and sidestep the need for large amounts of initial product funding. It has 3 components to it. Eric Ries related them all to driving a car. The first thing you have to do is have a destination. Before you start any journey, you must have the end destination(product) well thought out. Then, you must find the quickest path to the destination. As a startup, you must find/create your minimum viable product as quick as possible before running out of funding. The last component is to accelerate to your destination. You should be trying to hit all your goals in a short time span and gain as much attention as you can. You should be rolling out new versions of your product every week that fixes bugs and slowly adds features. Your customers don’t want all the bells and whistles yet, they want a barebones product that actually works! How Does Follow My Vote Exemplify the Characteristics of the Lean Startup? The team at Follow My Vote seeks to minimize the costs of production while showcasing how blockchain based voting can be the future. We don’t want to squander the money we raised from our kickstarter; therefore, we will continue to release new versions of our software as fast as we can. Our initial alpha came out recently (click here for more info) and we don’t want to slow down. About the Author: David Brock is a marketing intern at Follow My Vote. He hopes to apply his education at Virginia Polytechnic and State Institute to help fix problems around the world.